"Love: That tender, inexplicable feeling which is the germinal essence of the human spirit, is the rudimental element of the soul." "The sense of taste is directly connected with the preservation of the body. A delicious flavor produces a desire to eat a savory substance." Doctor Ray Vaughn Pierce was a traveling medicine man at the turn of the century with a simple perspective on life, health, + family: The woman is the provider of life and the caretaker of the home. Therefore, when the woman is happy, the home is happy. 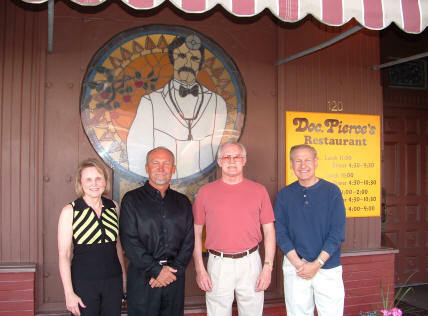 Witnessing regularly the stressors of childbearing and the duties of serving a household, Doc Pierce made it his priority to find a cure-all for the young women he encountered. And thus the "Golden Discovery" was born, a medley of herbs with the slightest tincture of what was once used in strains of liquid opium. It's possible that this medical discovery kept the young ladies he doctored fairly buzzed... But if his goal was to keep women and the family happy, what a better solution than a strong drink, all the more enjoyed around a table with hearty food, laughter, + conversation with friends + family. Originally, Doc Pierce's Saloon was inspired by this sign on the side of the building. When the building next door burned and was torn down, the sign was revealed. "About a hundred years ago, a man knocked on the door of a farmhouse next to the road here just a few miles south of Logan, Utah, and asked if he could paint an advertisement on the side of the barn. The barn's still standing. So is the ad. Through blizzards and droughts, through war and peace, through the Great Depression and Great Recession, through the Hippie Era and the Internet Age, through you name it, "Dr. Pierce's Favorite Prescription" has come out on the other side. Just don't try to buy the prescription. The company went out of business sometime in the 1940s. From all historical accounts, Dr. Pierce's Favorite Prescription, which he marketed toward women, was wildly popular in its day. It was first concocted in the late 1800s by Ray Vaughn Pierce, a Buffalo physician, and contained, among other ingredients, opium and alcohol. People would take one shot and swear they were cured. Then they'd take another shot just to make sure. 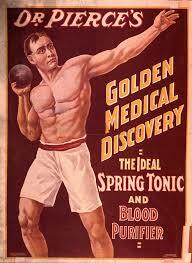 By the turn of the century, Dr. Pierce was selling nearly 2 million bottles a year through the mail. It's one of the reasons they're called the good old days. 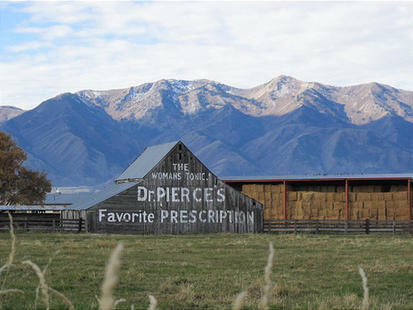 To spread the word, Dr. Pierce seized on the idea of using the sides of barns close to roadways to publicize his medicine. In essence, they were America's first billboards." An ad still on display on a barn in Logan, Utah. A vintage newspaper ad reprint, circa 1911. ​Free Refills on Coffee, Tea and Soda's.